There are certain dietary habits that are known to cause breakage of orthodontic appliances, as well as increase the risk of dental disease. Dr. Caponera's aim is to achieve the treatment goals with as few disturbances as possible due to appliance breakage, and to minimize the side affects of poor diet choices. Remember, teeth move best in a healthy environment and in individuals with excellent overall health. Be sure you have a well-balanced diet. Sticky food or candy of any kind (taffy, caramels, Tootsie Rolls, Gummy Bears, Now and Laters) damage appliances by bending wires and pulling cement loose. Hard food or candy of any kind (Jolly Ranchers, pizza crust, hard pretzels, beef jerky, Doritos, Fritos, Cornuts, raw carrots, nuts) may do damage by bending wires, loosening cement under the bands or breaking the little brackets and tubes that are attached. 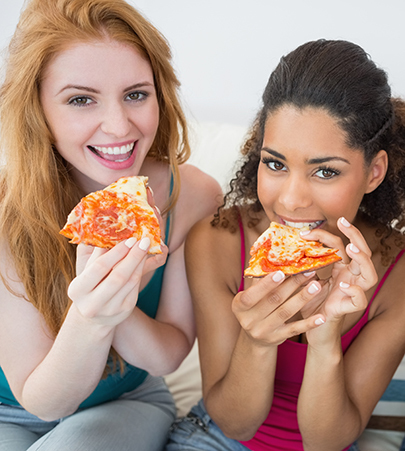 With Invisalign aligners, there are no restrictions on what you can eat.